May 14th, 2013 | News and Events, Wheaton World Wide Moving. 11. Change the locks on your new home. There’s no doubt that there’s a lot to think about once you’re moved in to a new home. Not only are you trying to rearrange all of your furniture and unpack your boxes, but you’re also hooking up utilities and appliances, navigating new roads, and trying to adjust to your new space. Changing the locks on your new home might be the last thing you think of, but it should be one of the first things done upon arrival. There are obviously lots of things to worry about when you’ve moved, but your safety in your new home shouldn’t be one of them. Even though the previous tenant or realtor might have changed the locks, it still wouldn’t hurt to do it again. Not only will you get an added sense of security, but you’ll also be able to get as many copies of the keys as you need. 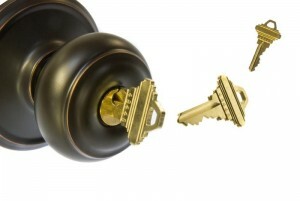 Changing the locks to your house is a relatively easy yet important task. Don’t let it sink to the bottom of your to-do list. What else is a priority when you move in? Leave us a comment and let us know! Wheaton has tons more moving tips – we’d love to help educate you so you can have a successful move. When I move, the first thing I do is to assemble the bed & put clean sheets on it. I’m usually exhausted by the end of a day of moving, and the last thing you want to do at that point is make the bed! Great tip, Kate! It’s good to get all of the most important tasks done first since it’s easy to get tired right after completing a move. Thanks for sharing!